In this episode: The parent of a 5-year-old girl and 2.5-year-old boy describes their play as generally creative and happy, but she sometimes observes what she believes is “manipulative behavior and unkind talk during disagreements.” This mother is wondering if it’s appropriate to intervene and correct what she perceives as unhealthy behavior, or whether it’s just part of their personal and social development. Hi. This is Janet Lansbury. 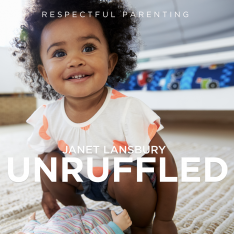 Welcomed to Unruffled. 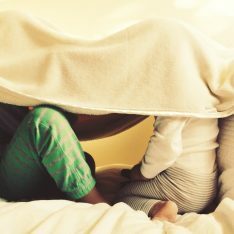 Today I’m responding to an email from the parent of a five-year-old and a two-and-a-half-year-old, who she says enjoy creative and imaginative play together, but sometimes she notices that their play seems to include manipulative behavior, unkind talk or poor attitudes. This mom is wondering when to step in and when to let them work it out by themselves. “Hi, Janet. I’m so thankful for your podcast and the mission you’re on to make parenting a joy-filled experience. It is no easy feat to enrich laundry-folding or washing a sink full of dishes. Your episodes have even made exceptionally difficult workouts more enjoyable. Hats off to you. Well, I appreciate that, and it sounds like there are some wonderful things going on here. Her children who have a bit of an age gap, are playing together. They’re happily playing together. That’s a huge feat in itself, and now I guess there’s another baby. This is a big adjustment for both children, as it is with one to two. It’s just as much an adjustment from two to three. The fact that they have turned to each other and are enjoying exploring these play ideas is extremely positive. No downsides here. I imagine there is some wonderful bonding going on between them. First, the therapeutic value of play. Time for self-directed, uninterrupted play needs to be a priority from birth, that we allow time for children to process situations, to daydream, to explore these different scenarios, as her children are doing, to work through them, to understand them better, to figure them out. The therapeutic value of play is one of the many reasons we shouldn’t interrupt, and we shouldn’t insert our own judgments that might discourage it. That does tend to discourage what children are doing. We want play to be a pure experience as much as possible. It is so precious. What this parent describes in relation to the imaginative characters — the manipulative behavior, the unkind talk with the poor attitudes and the example she gives about her daughter threatening the puppy with a consequence, “Fine, Puppy. No more puppy treats for you.” Speaking to her brother in a manner that this mother doesn’t want to hear. That’s understandable. But again, what children do with play is they explore. What does this power feel like when you hold a consequence over someone’s head or threaten them, scold them? How does that feel? Now, from her brother’s perspective, we might be concerned that his feelings are getting hurt, or that he’s feeling bossed and manipulated or is passive in this. Remember, he’s playing too, and he knows it’s make-believe. One thing children know better than even their parents sometimes is their sibling. He knows everything this girl does. It’s fun. It’s fun to play both parts of this. And as his mother says, they’re happy in this play. I don’t think … If one of her concerns is that he’s somehow being affected negatively by this, I would take that concern off your plate. I believe that’s untrue. He could stand up if he wanted to. He could be the puppy that bites or lashes out, but it sounds like he’s not. He okay with this exploration as well. And maybe there’s something that he’s therapeutically processing in this also. I love, love, love that this mother is aware that her daughter may be picking this up from “the not-so-proud moments of parenting.” That’s great self-awareness to have and could very well be true. What we do know for sure is that she picked it up from somewhere. Children don’t invent these things from inside themselves, these attitudes or this way of talking or behaving. She picked it up from possibly her mother or other children on the playground or in school that maybe got it from their parents. So, she’s doing the best possible thing she could do with that experience. She’s working it through her system, figuring it out so that she can let go of it and move on. One of the downsides to us intervening and judging that play is that it actually can infuse these attitudes or ways of talking or behaving with a lot of power. And then it turns from being this authentic, healthy exploration to a different kind of exploration. The exploration of my parent’s reaction to this. Children know when it pushes a button in us or bothers us. And instead of that discouraging them from doing it, more often the child now wants to do this all the time, even after they would have been done with the exploration that they needed to process it. Because again, now they’re processing how this is so powerful with my parent. This gets a rise out of her. She’s uncomfortable. Those are two reasons not to intervene. One, healthy processing, the best thing a child could do with what she’s exposed to. Two, our intervention can actually perpetuate and encourage the behavior. These kinds of questions often come up in regard to things like gun play or being scary monsters. Parents have asked me about the child hurting a doll or a stuffed animal, and if they should intervene in that. All of these things fall into the category of a child needing to process what they’ve been exposed to. That is their inclination, and they work through it until they get to the end. We see this in other ways. We see this in children being exposed to something that confused them or disturbed them. They might play it out, or they might ask a lot of questions of the parent, ask the parent to go over that story again and again. That comes from the same instinct to process, and process to completion, and only that child knows when they’re done. To give another example, a parent I know once asked me, she explained that her partner had taken their daughter, who was four at the time, to see an animated movie that this parent would not have wanted her daughter exposed to. There were some kind of sexualized images in it, and this parent, who is very sensitive and aware, knew that her daughter wouldn’t understand some of it and that it would be a little uncomfortable for her to be exposed to this. But then she said that her daughter wanted one of the figures. She wanted a doll of one of the characters, who was I guess dressed sort of sexily. Of course, the parent’s first instinct was, “No, I don’t want her to have that doll.” I think she was surprised at first when I suggested that if the parent didn’t mind spending the money and all that, she might actually consider setting her the doll, because then her daughter would have the opportunity to work through anything that had confused her or disturbed her that she had been exposed to. She could use this doll to play out that experience. Anyone who’s read my posts or listens to my podcast will know that I revere children’s play for so many reasons, and this is a big one. They have such healthy instincts. They know what they need to work on. And this can give us a lot of relief actually, that we don’t have to worry about that. When you intervene in that manner, children will take the direction. They’re much more likely to. If they don’t, it’s because they’re really overwhelmed and tired, and they might need you to remove them from the situation. Otherwise, if you come in and give any kind of intervention with empathy, with neutrality and no judgment, children turn the corner and continue and move on. If any of that happens, that’s what I would advise this parent to do. Otherwise, all I can say is, woo-hoo, enjoy this! Thank your lucky stars that you have this wonderful situation. Don’t worry. Let go, enjoy, and be interested. When children are doing different things, approach it with curiosity in yourself. Again, I’m not saying to intervene in it, but I would be curious. I wonder where she got that. Sometimes we can look at ourselves and say, what am I modeling here? Or, if we know that it’s not coming from us, we can wonder about what she’s being exposed to, and we can marvel at our child’s amazing ability to process. I hope those thoughts help. 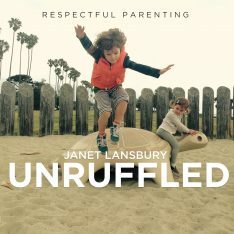 Also, please check out some of my other podcasts on my website, janetlansbury.com, they’re all indexed by subject and category so you should be able to find whatever topic you’re interested in. Also, both of my books are available on audio at Audible. 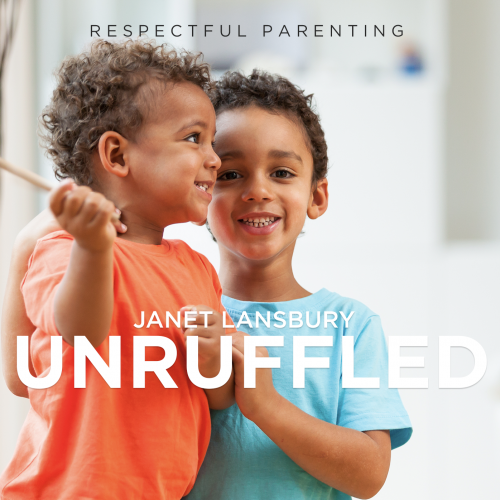 No Bad Kids, Toddler Discipline Without Shame and Elevating Child Care, A Guide To Respectful Parenting. Just follow the link in the liner notes of this podcast or go to the book section of my website. You can also get them in paperback at Amazon and an ebook at Amazon, Barnes and Noble, and Apple.com. Just wanted to take a moment to warmly & sincerely THANK YOU for taking the time to answer my question about imaginative play. I found myself smiling, nodding & giggling along with your response & I could not agree more with your thoughts. You are a gift! Press on and MANY THANKS!